I have been scheming all week to find a day that I could sneak away from work and family obligations to get the boat out for another sail. Today was that day and even though I didn't get out until 3:30, I ended up spending a solid three hours on the water. Originally I was going to go up to Newfound Lake in Bristol, but time constraints kept me from making the 45 minute trip up and settled on Webster Lake in Franklin. In retrospect, I'm glad I didn't choose Newfound because it would have been pretty rough because it is a much larger lake than Webster and provides a longer fetch for the waves to build. The forecast called for 8 - 12 kts, but when I showed up, the wind was clearly gusting higher than that. Oh well, it's a nice day and the water's warm if I dump it. I'm still figuring out the best way to rig and get going on a beach launched boat, so I'm sure I looked fairly ridiculous flopping around trying to get going. Anyway, once out into deep water and feel the full effects of the wind the boat really started to kick. Going upwind I was close to planing and slightly off the wind there was no question about it. I was kicking up quite a rooster tail. I wish I had the foresight to turn on my GPS to record speed, but my hands were pretty full. Remember that I'm used to big keel boats and planing sailboats is new to me (my 17' O'Day Daysailer comes close to planing but it has to be really windy). What a blast. I spent a good hour just reaching back and forth across the lake whooping as I got up on a plane each time. 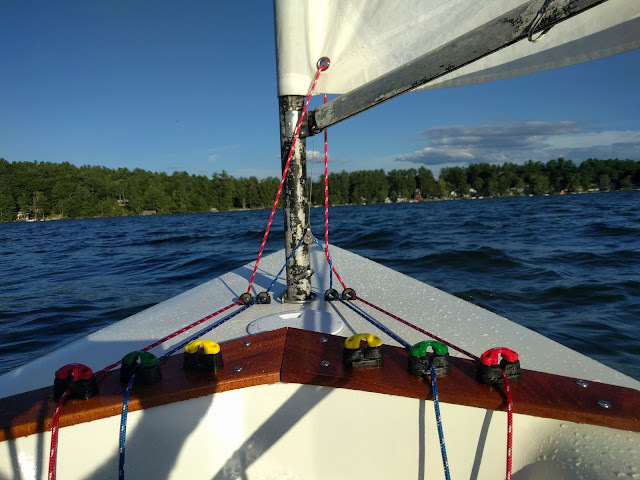 The boat is obviously responsive, but the wind wasn't too gusty today so I didn't have much trouble balancing the helm and easing off when it piped up. Two sunfish ventured out and I played with them for a while (I caught them both with ease), before trying a few gybes and some far off the wind tacks. This is where things got dicey. The gybes were ok, but heading downwind was an exercise in oscillation mechanics. With the waves on the quarter, the boat would get pushed upwind a bit, and when I would counter the helm, the boat would roll back downwind. I think it's called a 'deathroll' and even though I didn't actually capsize, I had a number of crash gybes as a result, and came really, really close to going in. I learned a lot today. For starters, I need to work on tacks on such a small boat. To help with that I think having a cam lock for the mainsheet would help to free up a hand to help with moving. I'm still waiting on my vang line that I inadvertently forgot to order along with the rest of the rigging, I suspect that could have helped out a bit today. I definitely need to work on getting started off a beach and of course I need to figure out the whole downwind 'deathroll' thing. Finally, I learned that in any kind of breeze you will NOT stay dry; which is ok by me. Oops, my downhaul and outhaul are twisted.